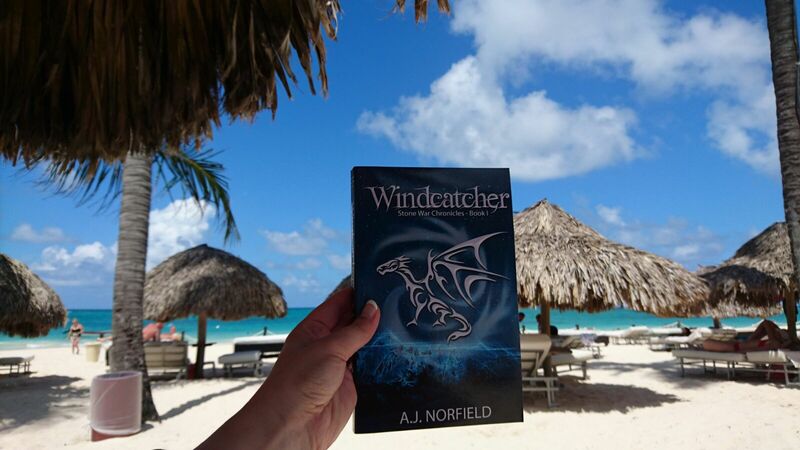 This picture was sent to me by a fan; it’s by far the most exotic place I’ve seen Windcatcher being read. I’m sure Galirras would enjoy a wing-trip down to similar exotic and tropical places. In fact, book III will just do that (shhh don’t tell anyone). But first book II needs to get done! The first draft’s final sentence is crawling closer every day and I think the story has filled out nicely. More information about book II should come online in the upcoming months. This weekend, I will try out something new. As an experiment I decided to join the Virtual FantasyCon 2016, which is taking place through Facebook, blogs and other websites; starting Sunday the 9th of October. This is an 8-days long event, where each day is focused on a different genre. The organization has been busy for months to put things together and make it a fun experience for those that attend. And attending is easy; you can just do it while you sit in a lazy chair. In visiting a physical convention each guest would come across author booths, with an author sitting on the other side. Guests would be wandering about the event in costume, celebrating their favourite characters. Perhaps giveaways would take place and panel discussions up on a stage. You don’t have leave home to attend.Distance is no longer an issue.Waiting in line no longer exists.It offers an opportunity to connect with participants and find new books and authors.To discover new blogs to read or sign up for.Artists will share artwork for books as well as original pieces. There will be Panel Discussions via Youtube.Fun features, such as Cosplay, the Scavenger Hunt and Giveaways will leave you smiling. Author / Artist / Blogger / Book Service / Publisher BoothsScavenger Hunt BoothCosplay BoothVendor Booth (booths relating to craft, book related items, jewellery – limited spots)GiveawaysThe Author’s Cache BoothPanel Discussions and Meet your Author via our Youtube Channel.A Keynote Speaker as an introduction.Mini Interviews and a chance for each participant to promote and share their creative work or service. For those that decide to attend, have fun. And feel free to drop by and chat on my Facebook page if you feel like it.